Ruamchitt Hotel is a historic family owned hotel that offers unbelievable comfort and convenience whether you’re on business or holiday, located in the center of Bankok’s Sukhumvit District close to the famous Terminal 21 Shopping Mall. 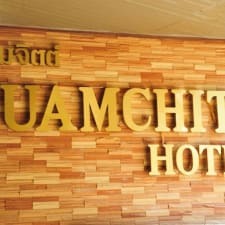 The Hotel just five minutes' walk from the Sukhumvit MRT Subway Station or Asok BTS Skytrain Station. Ruamchitt Hotel offers free Wi-Fi, outdoor pool, Bush Garden bar and restaurant, Laundry services, and a 24-hour front desk. The room include en suite bathroom, with shower, hairdryer, with complimentary amenities and 2 bottles of water. There is satellite television, telephone, and air-conditioning.